So, I know we already did a “Yokai of the Week” post this week, but we miss Lauren and we thought we’d do a tribute post in her absence. The Moore has a love for wings and corn dogs in the context of podcast meetings, and is known for improving the overall morale with off-topic discussion. 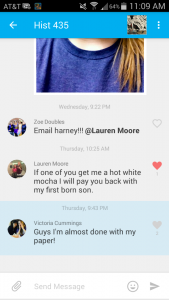 I’ve never personally seen Lauren sumo wrestle, but anything is possible. She’s more likely to challenge you to a game of basketball though, and you will lose. I know for a fact that she doesn’t have any water in a bowl on her head, so you can’t trick her into bowing as a weakness. 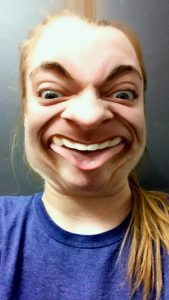 However, if you bring an offering of a white chocolate mocha, she will give you her first born son(Featured below) and will probably be your friend. All in all, the Moore is fantastic and we can’t wait to regroup Monday! 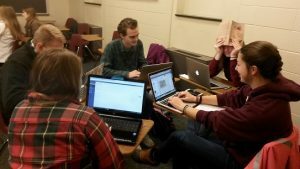 Some of us will meet Sunday to discuss music, a little bit of discussion restructuring, and Monday we’ll finish up recording and creating our presentation. It is a dark night. The moon is full, shining bright among the stars. A campfire is set in the middle of a dark wood with the History 435 class all huddled close together sharing spooky tales from Japan and China. Suddenly, a cloud covers the moon and a shadowy figure emerges from the woods and takes a seat among the students and begins to tell a tale from the mountains…. 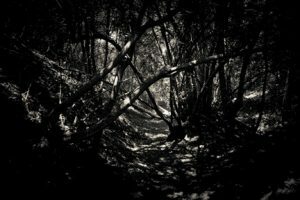 While this isn’t necessarily a super scary story, you probably didn’t drop your s’mores, and there would be no way for me to post this blog from the woods 😉 I will just have to tell you of this interesting tale/creature that brings up both the topics of ghosts, which we have been going over in class, as well as yokai, which is what Group 6 is heavily focusing on. 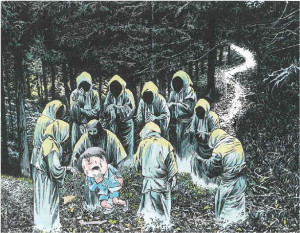 The hidarugami are a type of ghost that can be found in the mountains of Japan. They are the souls of those, like my super scary story said, who died from starvation while being up in the mountains. They are not properly buried and so this can cause unrest among the spirits, allowing them to leave their bodies and haunt the mountains on which they died. Hidarugami will be near trails and mountain passes, making hikers suffer the same hunger pains that they suffered before death. If a hiker dies during this encounter, they join the ranks of the hidarugami, haunting the mountains forever. So how does one defend themselves while traveling alone in the mountains?? Well first off, try not to travel alone, but lets not state the obvious. There is a simple way for preventing and/or surviving an attack from the hidarugami. All one must do is carry around a staple crop, a mouthful of rice or other grain. (They can also carry a bento or a couple of rice balls). 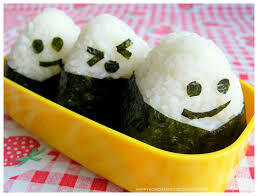 When the hunger strikes, the prepared traveller will eat a bit of rice or part of their bento and the hunger will fade. However, exercise control and don’t eat all of the rice in one sitting. You never know when you might need more (que the ominous music). The hidarugami occupies a special place in Japanese horror/warning tales because of the debate on what type of creature the hidarugami actually is. The way hidarugami is written uses both the katakana ヒダル (hidaru; most likely tied to the word 饑い hidarui which means hunger) and the kanji 神 (kami; god). This makes the word “hunger-god.” It is also fascinating to note that other “evil” gods are referred to in a similar way, namely the Binbogami (貧乏神; God of Poverty) and Shinigami (死神; God of Death). But is the hidarugami a god or a vengeful spirit? Is it a yokai or a yurei (ghost)?? Careful not to think too hard, your head might explode… It’s a trick question!! The answer, in this case, is always yes! As a yokai, it is a type of Tsukimono, or a yokai that possesses the ability to possess people (pun intended). As a yurei, the hidarugami can be called either an evil spirit (akuryo 悪霊) or a vengeful spirit (onryo 怨霊). But they aren’t typical yurei since they actively pursue and create new members and are bound to a single location, the mountains in which they died. They can also be considered as muenbotoke (無縁仏). These are the unworshiped dead and there are special feasts held in order to let the spirits pass on and the hidarugami can usually be taken care of with one ceremony since it is not vey strong. And finally, they can be tied to Buddhism and the Gaki ( 餓鬼), the ghost of hunger from Chinese and Tibetan mythology. These spirits are created from gluttons who are forced to come back as fowl starving creatures that feed on gross things like dead bodies and poop. Another cool fact is that the Japanese have a different yokai for those who die abandoned on a mountain and others who die in a battle or from a famine and remain unburied. The gashadokuro is a giant skeleton yokai that is born from the fallen soldiers of a battle who are buried in mass graves and/or the victims of famine who also receive poor, if any, funeral rites. They too are born as hungry spirits, driven by pain and hate, turning into a grudge against the living and manifesting in the giant skeleton which is powerful and impossible to kill! Heed all of these things and you just might make it out of the woods and home in time for dinner. While Group Death has bloodied itself carving through the core of Tanabata intricacies, we have also found other interesting bits to mention that doesn’t fit cleanly into our podcast. Tanabata is not the only festival in August or July. Another festival called the Obon festival is often mixed up with this holiday. A while back I mentioned how the reading to the kanji for Tanabata should be ‘shichiseki’ but it ended up being called Tanabata to reference a purity tradition. Up until the Edo period many people would put shelves in their houses to perform ancestor worship. However nowadays most people do not perform these rituals, but instead show ancestor worship through the festival of Obon. 藤谷良秀. “Floating Lanterns”,21 August 2011. The festival lasts around three days. Families visit the places of their ancestors and clean their gravesites. Then, at last, they send candle-lit lanterns down a river. This is similar to tanabata in that strips of paper with wishes written on them are sent down a river. Apparently the original tanabata festival and the Obon festival were like a beginning and end for this sort of festival. Tanabata was a way to say hello to your ancestors, and Obon was a way to say goodbye. Therefore, many people believe the origins of the Obon festival started with the tanabata rituals. But what does tanabata have to do with youkai? It doesn’t! In the Japanese version of the Star Weaver and the Cowherder there is already a milkyway. However, the main part of the story of Qixi is that a goddess created the milkyway to divide the two. In the Japanese version, the two are just forced to separate on either side of the milkyway. Which begs the question: Where did the Milkyway come from? There is not much concern for how the milkyway came about and the story of the creation of the milkyway is unpopular and fairly rare. According to You Seihou the Milkyway was created by an oni who, improperly, cut open a melon and its juices flooded the sky, creating the Milkway. There is not much information behind this story, but it is a bit interesting. It brings up many questions, specifically, why does a youkai create a beautiful river of stars in the sky? It’s a mystery that would require a trip to archives in Japan, not something any of us have time for. Tanabata is a not-so-creepy love story that has a little bit of associations with death, thus it fits nicely into Group Death’s interests. See you all nice time with other gory details about our podcast! You Seihou 楊 静芳.中日七夕伝説における天の川の生成に関する比較研究. “A comparison of the creation of the Milky Way in the Chinese and Japanese Tanabata Legend.” Tokyo Gakugei University Repository, 2012. 上江洲, 規子. “実は七夕はお盆と関連が深かった？日本古来の七夕の意外な事実.” 住まいの「本当」と「今」を伝える情報サイト【HOME’S PRESS】. May 23, 2015. Accessed January 17, 2017. http://www.homes.co.jp/cont/press/reform/reform_00215/. There are many different types of Yokai that roam around the Japanese archipelago, from the mighty Oni to the slippery Kappa. With such variety of creatures one can only imagine if there is a leader among the madness. And what a leader it is. From humble, uncertain beginnings, the Nurarihyon grew to be a prominent figure in the modern day understanding of yokai in Japan. Nurarihyon has an interesting role in both the media as well as social structures. In modern times, nurarihyon is seen as the supreme commander of the yokai and is a prominent figure in manga and anime. 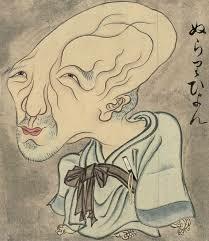 In the past, nurarihyon was an obscure figure that was eventually used to depict the social hierarchy of Edo Japan. 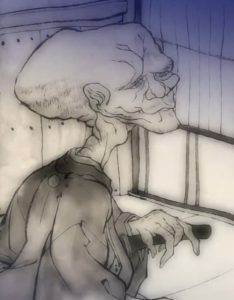 In this post, I am going to go into his unknown origins, how he “evolved” into the yokai no oyadama, or “leader of Yokai,” and how this image has been shaped by media and politics throughout his history. But before all that, let me set the stage by delving into the meaning(s) of his name. Michael Dylan Foster, author of The Book of Yokai mentions that “in a standard Japanese dictionary, the word nurarihyon ぬらりひょん is described as being synonymous with nurarikurari, which refers to something (or somebody) with no place to grab onto” (218). For me, this description is interesting both based on the type of yokai Nurarihyon is and the fact that his origin is grasping and mysterious, not really having a set place. The characters of his name are also interesting. They mean “slippery” 滑 “gourd” 瓢 (Nurarihyon). This depiction in characters may be based on his image, which depicts him with a long, bald cranium as well as his behavior which is slippery and hard to pin down. Foster also mentions a Japanese proverb about trying to catch a cat fish, which is often how Nurarihyon is physically compared to as looking like, with a gourd (Foster 218). The origin stories of Nurarihyon vary and there is no set version. 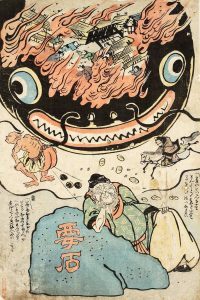 There is another yokai by the name nurarihyon, a spherical object that lives in the ocean and was once thought to be a type of Umi Bozu, an ocean yokai that is said to appear in calm waters and is a sign of a storm or danger to a ship(Davisson). This version of nurarihyon is said to bob in the waves and disappear whenever sailors would reach out to touch it, only to appear again further out of reach. Many people think that this could have been our modern day nurarihyon’s beginnings, evolving into the monk-like figure we have today. And in a way, they’ve got it right. Some of the first written records and depictions of this yokai begin with Sawaki Sushi’s Hyakkai-zukan in 1737. While there is no record or mention of Nurarihyon’s nature, he is depicted as an old, monk-like figure with an elongated head (Foster 218). A Folklorist, Fujisawa Morihiko, in 1929 “labeled an image of nurarihyon with the caption “leader of the yokai” (yokai no oyadama) (Foster 218). However, there is no reasoning as to why he gave nurarihyon that title. By the 1970s, the modern concept of nurarihyon began to finalize with the addition of the Ichiban Kuwashi Nihon Yokai Zukan (Most Detailed Illustrated Encyclopedia of Japan’s Yokai). The title given to nurarihyon was that of Yokai Sodaisho, the Supreme Commander of Yokai (Davisson). Mizuki Shigeru, a modern day manga author and anthropologist, has a comic that includes this yokai. 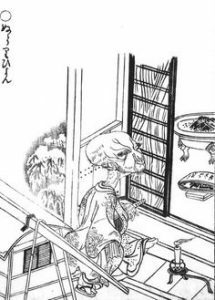 Nurarihyon is said to not only be the leader of the yokai but also will sneak into your house and drink your tea and eat your food before disappearing (Foster 218). One hectic days when the household is running around with barely a second to think, Nurarihyon slips casually into the house and sits down to a cup of tea acting as if he were the Lord of the Manor. People who see him and the casual ease with which he takes authority assume that he must indeed be the Lord. They fall upon themselves serving him, and don’t realize how they have been deceived until he is gone (Davisson). 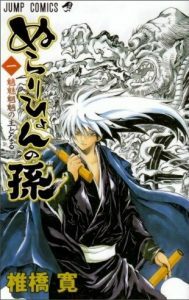 Now in modern media, popular anime and manga series, Nura: Rise of the Yokai Clan and Nurarihyon no Mago, portrays nurarihyon as the supreme commander of the yokai and the series follows the grandchild of nurarihyon and his yokai and human adventures. With this history of nurarihyon established, we can now delve deeper into the mystery, both in origin and social implications, behind this yokai. As a potential water yokai, nurarihyon has had a constant tie to the water, whether through his origins or through his description as catfish-like. In the Ukiyoe-zushi kosniki Haidokubara there is only one sentence describing nurarihyon: “Nurarihyon looks like a catfish, without eyes or a mouth. It is a spirit of deception” (Davisson). While this image has not stayed with us, the term “catfish-like” and the deceptive nature has stuck with nurarihyon. There is also some debate in his origin. In Murakami Kenji’s Yokai Dictionary, there is talk about how the modern-day image of nurarihyon is just the fabrication of Toriyama Seiken to match his drawing (Davisson). 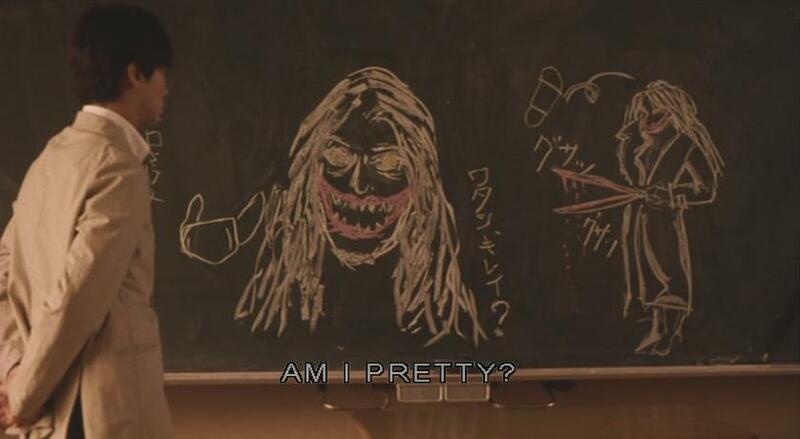 It is also this drawing (to the right) in particular that sparks an interesting line of questioning with nurarihyon. The Japandemonium Illustrated: The Yokai Encyclopedia of Toriyama Sekein is a collection of Sekein’s four works along with modern commentary. This image from the encyclopedia depicts nurarihyon stepping off of a palanquin into a house wearing fancy robes and carrying a single sword. It is these characteristics that suggest the nature of this cartoon as a political one. The palanquin and fancy robes are symbols of wealth or prestige while the single sword defines this figure to be a wealthy townsperson instead of a samurai, in which case he would’ve carried two swords (Sekein). Historical context of Toriyama Sekein’s drawing is set in the middle of the Edo Period (1615-1868). At this time, there were divisions of classes/people in the sense of honor and function. Samurai were the highest rank, followed by farmers, then artisans and merchants, which were often just thrown into the same category of chonin or “townsmen”. Merchants, however, were looked especially down upon since they themselves made none of the products they sold and their wealth came at the expense of others (Jansen 2000). It is this view of merchants that might have lead to nurarihyon being depicted as one. Jansen describes merchants being thought of as “parasitical, self-interested people” (Jansen 2000). Nurarihyon can be viewed as parasitical, as he takes advantage of a home. The Japandemonium Illustrated also goes into another source, the Seji Kenbonroku or Things I have Seen and Heard from 1812, that discusses the merchants rising status. “They rise above their status and look down on samurai…” (Sekein). Merchants also get described as loan sharks and more of that imagery can be seen in the picture (above) by the book that is in the house. This concept shows the established social orders were being challenged at the time the image was drawn, around the early 1800s. Merchants made up the lower levels of this social hierarchy, however, it is clear that they tried to rise above this and work to occur more wealth and status (Sekein). Nurarihyon is not the only example of politics and Yokai being mixed during the Edo Period. 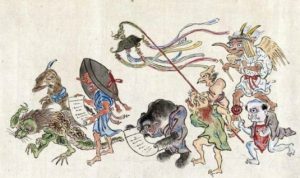 After an earthquake in 1855, depictions of a namazu-e, or giant, earthquake causing catfish, began circulating, eventually taking on a life of their own to speak on or against troubles in the political systems (Smits 2006). In his article, Smits focuses on “the political consciousness among Edo commoners in 1855, and argues that they used the namazu-e to express an emerging consciousness of Japanese national identity” (Smits 2006). Nurarihyon has had an interesting history and political significance through his claim to fame. From a humble beginning as an ocean yokai to an old, monk-like figure with no real purpose to a trickster with a taste for fancy tea and leadership, Nurarihyon has finally found a place to hold onto as a prominent yokai in modern day culture. Foster, Michael Dylan. 2015. The Book of Yokai. Oakland, California: University of California Press. Jansen, Marius B. 2000. The Making of Modern Japan. Cambridge, Massachusetts: The Belknap Press of Harvard University Press. Sekien, Toriyama. Japandemonium Illustrated: The Yokai Encyclopedia of Toriyama Sekein. Courier Dover Publications: 64. Smits, Gregory. 2006. Shaking Up Japan: Edo Society and the 1855 Catfish Picture Prints. Journal of Social History: 1045–1078. As Jacob described in his presentation this afternoon, Group 3 is discussing social interaction and responsibility in Japanese society based on the Confucian tradition and expectations. We will be discussing topics like filial piety and responsibility, lust, and the subdued role of women in the final draft of our podcast. The section relating to the subdued role of women has inspired my fellow group members and I to research various female Yokai and how they reflect Confucianism’s influence on the expectations of women in Japanese society. Earlier this week, we took a closer look at the Yamamba, or Mountain witch. This afternoon, I found another female Yokai, known as Ubume, in Michael Dylan Foster’s The Book of Yokai. The picture above depicts a ghostly woman with gray hair holding her newborn child. She is usually thought to be the spirit of a woman who painfully died during childbirth. Typically, an individual, most of the time a male, will meet her at a fork in the road or before crossing a bridge. Covered in blood and crying while cradling her infant, she asks the man to hold the child before disappearing. The baby becomes heavier and heavier in the man’s arms until he can’t move from fear of dropping it. In some legends, the man is rewarded for his dedication and effort with amazing physical strength and capabilities. 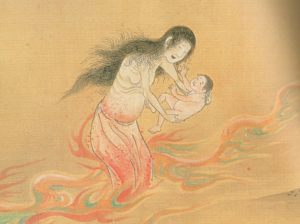 Death during childbirth was extremely common prior to the modern period, providing a potential explanation and origin for the conception of this Yokai. One legend or tale related to the Ubume details the story of a shopkeeper who is repeatedly visited by a strange woman. One night, the store owner follows the strange woman after she leaves to discover her disappearing into a graveyard before hearing the sound of a crying baby. As he ventures into the graveyard, the shopkeeper finds the corpse of the woman in a dug up grave with a healthy, live infant beside her. The child, in some legends, grows up to be a successful monk. 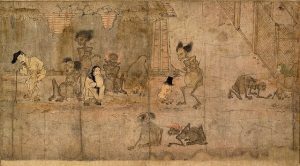 Within the context of Confucianism’s influence on the subdued role of women, I think the Ubume is an excellent example of the value placed on Japanese women limiting themselves to the responsibilities of the household rather than pursuing more impactful roles in society or government. A woman dying in childbirth meant the child’s primary nurturer and caregiver would be absent; this was surely seen as a tragedy, depriving the son or daughter of a vital foundation established during childhood that ensured success later on in life. Therefore, we see this mother searching for the proper environment for her child while crying over her inability to be there for him or her. While we have not incorporated this Yokai into the script, like we have with the Yamamba, I think it is definitely something to investigate further and see where this takes us. There is great potential for us to further expand the dialogue surrounding the subdued role of women and develop and build upon what we have already established with our secondary sources and the information on the Yamamba. Stay tuned for more information! Have a great weekend! Dylan Foster, Michael. 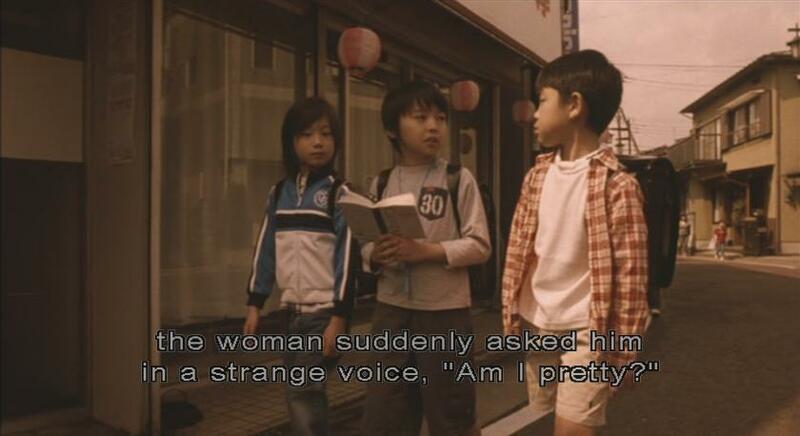 The Book of Yokai. Oakland, CA: University of California Press, 2015. We’re all here this time! We’re hard at work finishing up our script today and planning when we’re going to record for our audio draft due Tuesday. Have a great weekend, everyone!! Group Heian is moving along in terms of our preparation for the podcast. As Maddy mentioned in the blog yesterday, we have decided to use the Yamauba as our Japanese Yokai of choice in our podcast. We are also working on our scripts and will have our first draft done by tomorrow. We have had great success in accessing some extremely helpful secondary sources, and have found several useful books on Coufucian Ideology in the library. Jacob’s presentation should give more information on our sources, and if any group hears of a source they would find useful for their podcast, feel free to ask to use it! One challenge we have all found while writing content for the podcast is making our script sound like more of a conversation than a book reading. We are hoping this will be resolved when we all start recording together. Any tips on this subject would be appreciated! “One rainy night long ago, some fishers living on the Shimane peninsula witnessed an enormous white shape off the coast in the Sea of Japan. Squinting their eyes, it appeared to them to be a whale swimming offshore. Excited for the catch, they rallied the townspeople, who grabbed their spears and harpoons and took to their boats to hunt down and catch their quarry. They soon reached the whale, but no matter how many times they hurled their weapons, not one of them struck true. When they looked closer, through the dark, rain-spattered water’s surface, they realized why: what they thought was a white whale was actually a humongous skeleton swimming in the sea, not a single bit of flesh on its entire body. At that very moment, the sea became alive with a host strange fish that nobody had ever seen before, and the sky swarmed full of eerie birds which nobody could recognize and the likes of which had never been seen before. The ghost whale then turned sharply out to sea, and swiftly vanished into the current, taking all the strange fish and birds with it, never to be seen again. Whaling has been a significant feature of Japan’s culture for centuries. Despite regulations and protecting whales from commercial fishing, and promises to cut down on whale quotas, Japan went on to hunt and kill 333 of a single species of whale (http://news.nationalgeographic.com/2016/03/160325-Japan-whaling-minke-whales-Antarctica/). The story of the bake kujira may give us insight into why the whaling industry has continued to grow, it is an important aspect of the inhabitants of whaling village’s heritage and culture. Yes, they hunt and kill numerous whales, but in this story is a sense of reverence. 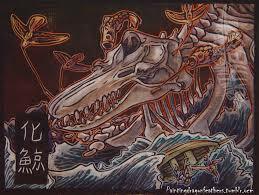 The spirits of whales are part of the religious/spiritual cosmos, and in that acknowledgement I see respect. The curse of the ghost whale may be the result of a subconscious guilt or regret for the exploitation of noble creatures, but of course the need for the resources a whale could provide outweighs this. Group Shudan Borei has completed our podcast outline, which means we have finalized our topic and the direction we are going to take! We will introduce four Yokai, the oni, kappa, nurarihyon, and kuchisake-onna. We will tell a relevant tale for each Yokai, and in turn discuss the origins, cultural significance, evolution of, practical uses, etc. We have decided to employ a host in a round table discussion format. We have also completed our proof of concept recording and it is ready to be sent in.